(a)	The first aspect is what the Upanishads describe as the ‘Self in us becoming all existences’ (Ibid, pg 168). This is ‘the basis our oneness with all’(Ibid) In the Vedas, this is the basis of One god (viz. Agni) that becomes all gods (Ibid). (b)	The second aspect is that mode which is described as ‘seeing all existences in the Self’ (Ibid). This mode of the Self containing all existences is the ‘basis of our oneness in difference’(Ibid) In the Vedas, it is the mode where One god contain all the other gods in oneself as ‘the nave of a wheel contains the spokes’ (Ibid). (c)	The third aspect is the mode of ‘seeing the Self in all existences’ (Ibid). This mode of the Self inhabiting all is the ‘basis of our individuality in the universal’ (Ibid). In the Vedas, it is the poise where One god like Agni is described ‘as a separate deity, one who helps all the others, exceeds them in force and knowledge, yet is inferior to them in cosmic position and is employed by them as messenger, priest and worker, -- the creator of the world and father, he is yet the son born of our works, he is, that is to say, the original and the manifested Indwelling-Self or Divine, the One that inhabits all’ (Ibid, pg 168-169). The simultaneous realization of these three modes of existence by the Divine Soul is not possible in ordinary mentality. The ordinary mind is capable of exclusive concentration ‘to dwell on any one of these aspects of self-knowledge to the exclusion of others’ bringing in a ‘human element of error into the very Truth itself’ (Ibid, pg 168). They exist as a triune realization only at the Supermind Consciousness which is a ‘comprehending oneness and infinite totality’ (Ibid). In fact the comprehensive self-knowledge of the Supramental cognitive field determines the relations of the Divine Soul with God or its supreme Self and with its other selves in other forms which though appearing to be separate are supported by an inalienable unity. ‘These relations will be relations of being, of consciousness and knowledge, of will and force, of love and delight. Infinite in their potentiality of variation, they need exclude no possible relation of soul with soul that is compatible with the preservation of the inalienable sense of unity in spite of every phenomenon of difference. Thus in its relations of enjoyment the divine soul will have the delight of all its own experience in itself; it will have the delight of all its experience of relations with others as a communion with other selves in other forms created for a varied play in the universe; it will have too the delight of the experiences of its other selves as if they were its own – as indeed they really are……And the same rule will apply to the relations of its being, knowledge, will with the being, knowledge and will of others….what is clash and strife and discord in our divided being will be there the meeting, entwining and mutual interplay of the different notes of one infinite harmony’(Ibid, pg 169-170). The Divine Soul will have the sense of oneness of the Transcendent and Universal Divine with its own being. ‘It will enjoy that oneness of God with itself in its own individuality and with its other selves in the universality. 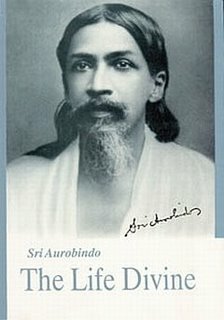 Its relations of knowledge will be the play of the divine omniscience, for God is Knowledge, and what is ignorance with us will be there only the holding back of knowledge in the repose of conscious self-awareness so that certain forms of that self-awareness may be brought forward into activity of Light. Its relations of will will be there the play of the divine omnipotence, for God is Force, Will and Power, and what with us is weakness and incapacity will be the holding back of will in tranquil concentrated force so that certain forms of divine conscious-force may realise themselves brought forward into form of Power. Its relations of love and delight will be the play of the ecstasy, for God is Love and Delight, and what with us would be denial of love and delight will be the holding back of joy in the still sea of Bliss so that certain forms of divine union and enjoyment may be brought in front in an active upwelling of waves of the Bliss’ (Ibid, pg 170). There is a difference in the mode of action of the ordinary mind and the Supermind. The ordinary mind executes its mind-power through ‘judgment, observation, memory, sympathy’ while the Supermind effects the ‘relations of soul with soul by forces, faculties, functionings proper to the supramental being’. (Ibid, pg 170-171). But before such a paradigm shift in the cognitive functioning is effectuated, it is important to understand ‘that the absence or abolition of separatist egoism and of effective division in consciousness is the one essential condition of the divine Life’ (Ibid, pg 171). In fact the presence of separative egoism that cuts one off from the inalienable unity of existence ‘is our “original sin”, or rather let us say in a more philosophical language, the deviation from the Truth and right of the Spirit, from its oneness, integrality and harmony that was the necessary condition for the great plunge into the Ignorance which is the soul’s adventure in the world and from which was born our suffering and aspiring humanity’ (Ibid). We are sons of God and must be even as he..